Reel Big Fish is an American ska band from Southern California that is best known for their part in the ska wave of the late 1990’s. During this time, they achieved mainstream success along with other ska groups of the time such as No Doubt and The Mighty Mighty Bosstones. 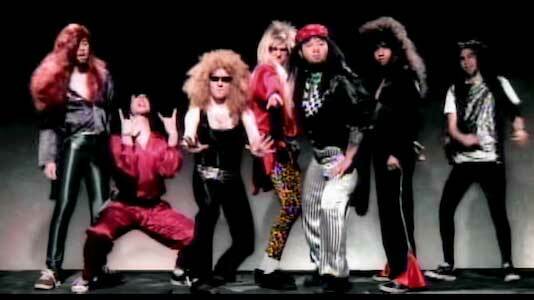 The group is probably best known for their 1997 hit “Sell Out”. The song was released as the first track on the group’s second studio album, Turn the Radio Off, in August of 1996. 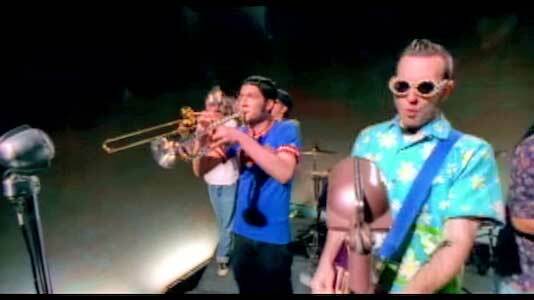 The song has proven to be one of Reel Big Fish’s more popular releases, and is still a ska standard to this day. The band turns into a corporate ska band. The song is a bouncy, uptempo ska track that features a lot of horns (two trombones and a trumpet). These horns really give the song a bigtime feeling, which fits in with the lyrics and story. The song is about getting discovered in the music industry, and singing with a big label. It follows a guy who works a low level job and has big dreams, but doesn’t want to sacrifice his art for money and fame. Eventually he does though, as he realizes that he “can’t flip burgers forever”, and resigns to the idea of being an artist at a major label. The song is a great piece of satire on the music industry that is also the quintessential ska song. The music video begins with a narration that parodies the serialization of soap operas, stating, “Previously on As The Fish Turns”. 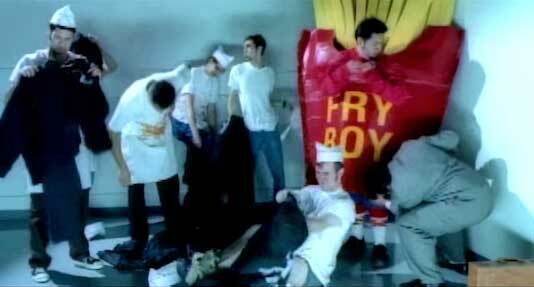 We see Reel Big Fish is working in a fast food diner (a nod to the first lyric of the song) on the side of an old highway when a “big time” agent comes up and offers them a contract. The band declines at first saying that a contract would just lessen their love of the music. However, they change of their tune when he shows them a briefcase full of cash. The band heads off to the record company with their agent, and they are “processed” by the label heads. They’re put in uniforms that read “SKA BAND” on the back (other groups are labeled as Rap, Rock, and Metal), and made to tryout in front of the rest of the label. We see that trombonist Dan Regan is wearing black chucks under his coveralls. Through all this Matt has been pulled into a dungeon to get his French Fry costume off, from which he eventually escapes. The label attempts to rebrand the band to no avail. The label building then blows up after Matt’s escape. It’s a funny video that plays well with the song, and highlights the absurd nature of being evaluated by a record company. ... and here’s what the band actually is. Click on the links below to get a new pair of chucks to audition in.